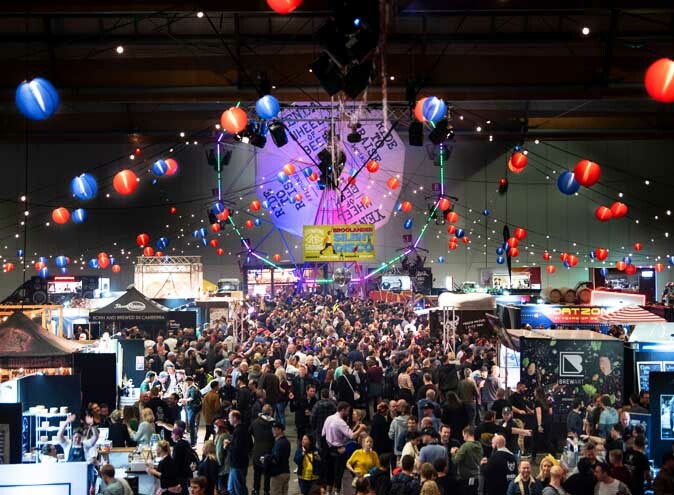 Are your date nights lacking fun and excitement? Weekly family dinners boring you out of your brain? Don’t fret, these restaurants have taken eating out to whole other level! You will find yourself having an experience rather than just a meal. 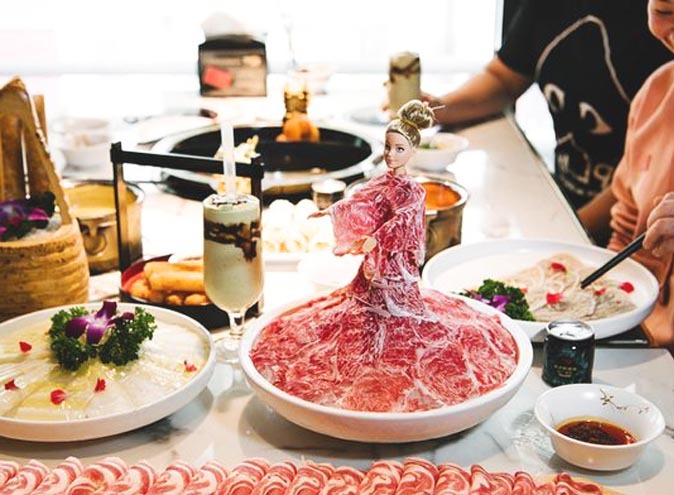 Barbie dolls, hot pot and robots – not three words you would normally hear together. Well Spice World do things differently. 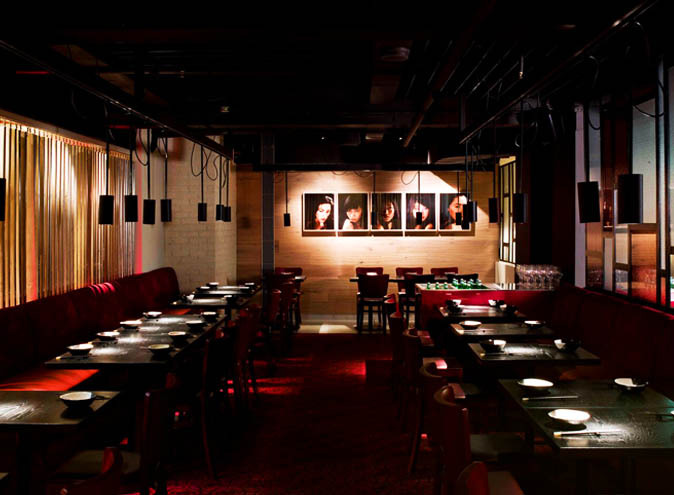 The first Australian outpost from one of China’s biggest hot pot chains is nestled in Haymarket and goes beyond and above for their customers. The journey starts as soon as you arrive, you will be greeted by two robots (with free mints!) who will take you into the restaurant which is essentially a taste of China in Sydney. The star of the show has got to be the Barbie doll wrapped up in Wagyu beef ready to be undressed and cooked at your table! There’s even stock cubes for your hotpot in the shape of Hello Kitty and teddy bears! To end your experience you can admire yourself in the ceiling covered in mirrors and use their steam machine to get the smell of hotpot out of your clothes. Make sure you don’t miss out on this incred experience! 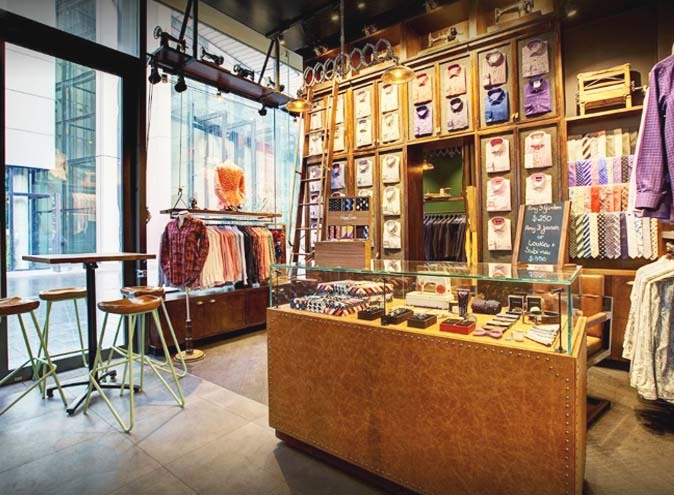 The perfect combination of shopping, eating, drinking and style is what Shirt Bar has accomplished. They are pretty much a one stop shop! Located on the water’s edge in Barangaroo, this restaurant is decked out in hundreds of different shirts and spirits. Shirt Bar has an old school, vintage vibe with dark brown leather accents and forest green spotted around the joint. The shirts are stacked up like books in a library and the alcohol shelved in rows upon rows. 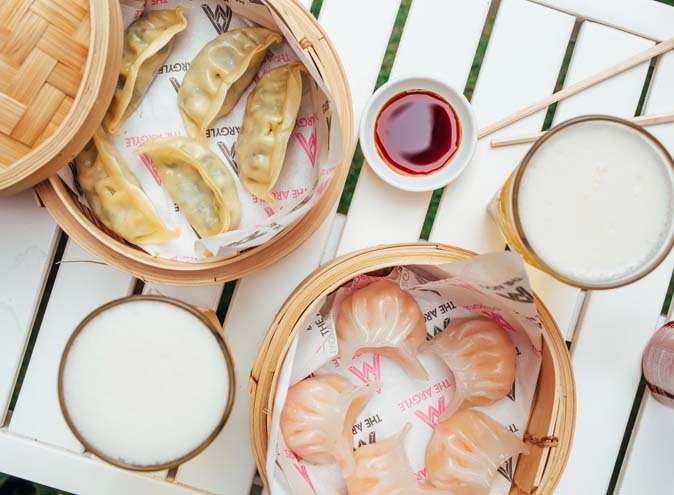 To make the most of your experience, dream up your ideal shirt while sipping on some whisky and indulging in their Peking duck bao or crispy pork belly. Not keen on a shirt and spirit combo, don’t worry we’ve got something else for you. Doughbox Diner is a 1950’s style diner with pinup and vintage glamour vibes. 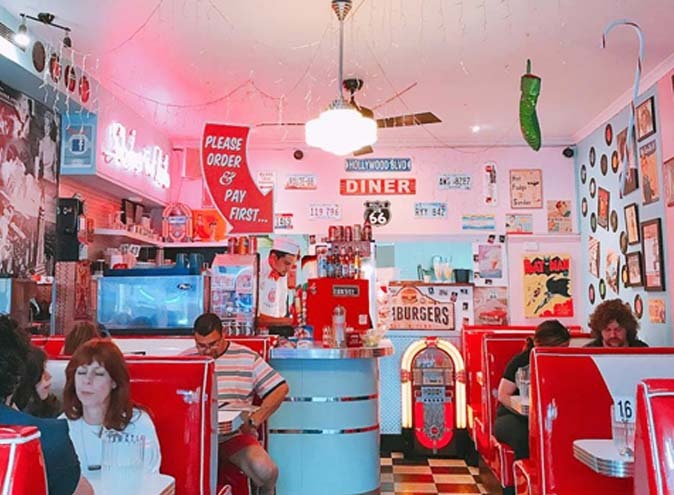 This rockin’ restaurant is renowned for their unique American inspired experience where waitresses dress up as ‘Diner Dolls’ and customers are seated in the typical shiny booths. You’ll feel like Sandy and Danny as soon as you step in! Their signature dish is their crepe cones which you can get sweet or savoury. Replace a typical burger with their Burgercones and finish off your meal with their number one best seller ‘Malt in my mouth’ cone, filled with Nutella, strawberries, maltesers AND white chocolate! Head into Doughbox Diner to satisfy all your naughty cravings! A playground for adults. 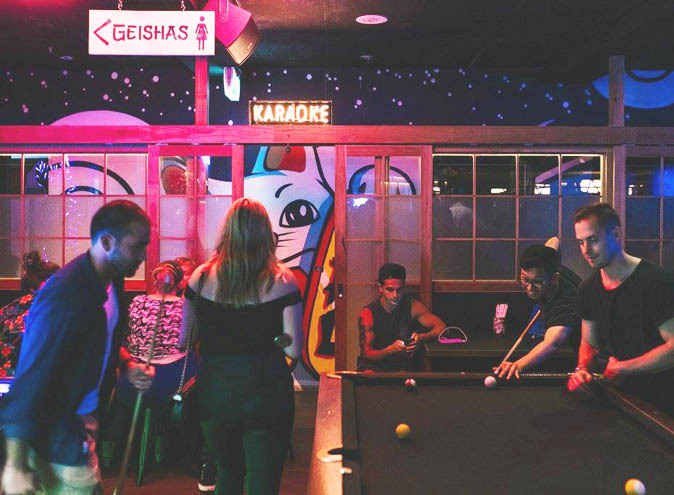 Goros is a Japanese inspired restaurant with karaoke, sake, arcade games, photo booths and late night food. This low lit bar with splashes of neon signs, lanterns, graffiti and old Japanese posters is perfect for your next boozy jam sesh or weekly dinner out. Their main focus is on yakitori but also they’ve also got some sushi and gyoza – the perfect mix! Grab yourself one of the 13 different sake’s or opt for one of their limited bubble tea cocktails. Get your hands on their Moshi Moshi #4 which is a perfect combo of gin, rose, peach tea, mint, lemon and of course some lychee popping pearls. Your night isn’t complete without a sake bomb which is essentially a jaegerbomb but with sake and beer! And of course, you can’t forget about the karaoke, which did we mention is FREE! They’ve also got air hockey, pool and DJs playing throughout the night. Combining fine dining and a nice view is pretty common right? 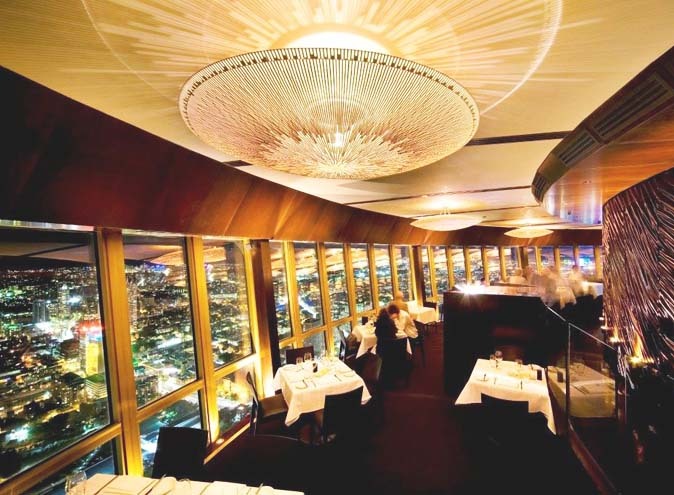 What about fine dining and continuous revolving views? 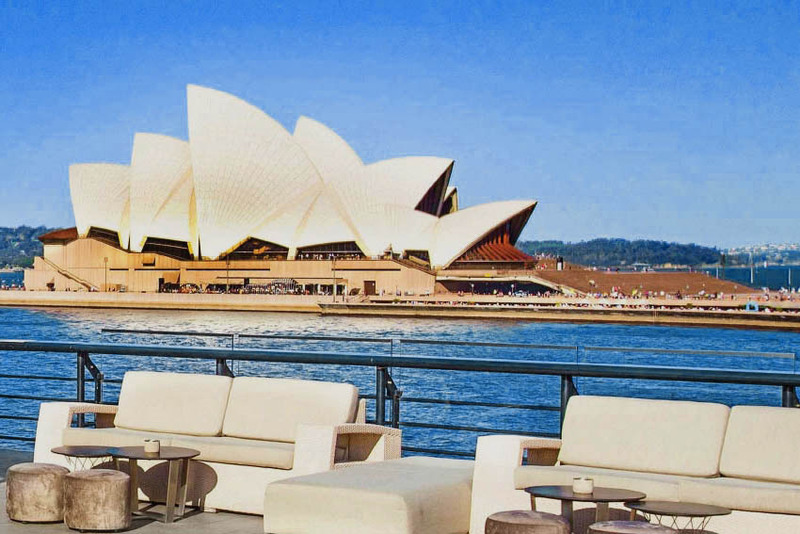 360 Bar and Dining is exactly that, a rotating restaurant which gives diners 360 degree views of Sydney’s skyline! Located high above the city, this restaurant is designed to stimulate your taste and sight senses. Their menu is based on seasonal and fresh produce and complimented by signature cocktails and award winning wines. 360 Bar and Dining is perfect for pre-meal drinks whilst watching the sunset or a culinary experience like no other with breath-taking views. Not just your typical Italian restaurant. Via Napoli pizzeria has answered all of our prayers. They’ve got 5 metre-long pizzas. 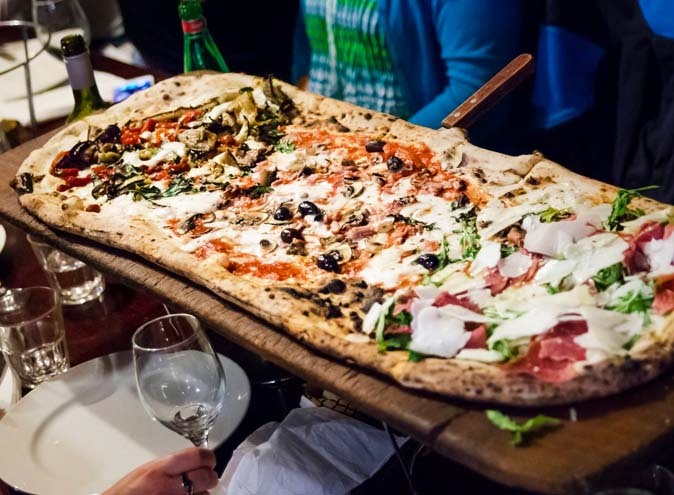 Bring your carb-loving friends and dig into one of the grandest pizzas in Sydney! To make it even easier, Via Napoli Pizzeria has three locations! These awesome Italians can be found in Lane Cove, Hunters Hill and Surry Hills. These guys pride themselves on their authenticity and traditional focus which definitely shows through in their food! Their entire menu is mouth-watering with 4 cheese and truffle arancini balls, homemade gnocchi in Napoli sauce and melted buffalo mozzarella and the Nutella pizza being some of the standouts! This is a must visit if your craving a bit (or A LOT) of pizza.